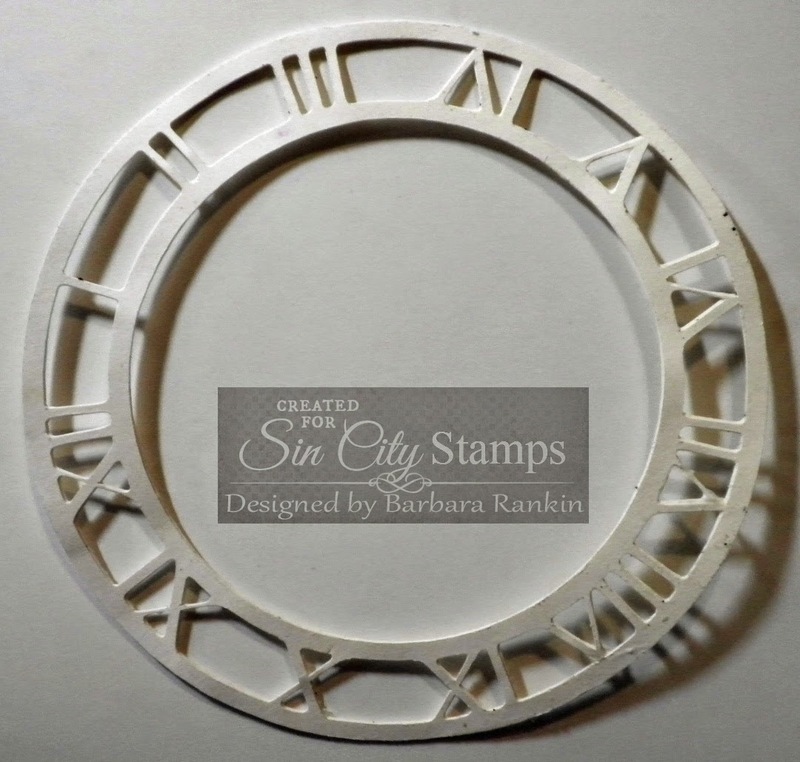 Hello, and welcome to my first Sin City Stamps post for December. This month, we are proud to have Walnut Hollow as our sponsor. I began my project with their rustic wood ledge. It is quite rough, but instead of sanding it, I covered it with a good, thick coat of white gesso. I wanted to maintain the texture without getting splinters. 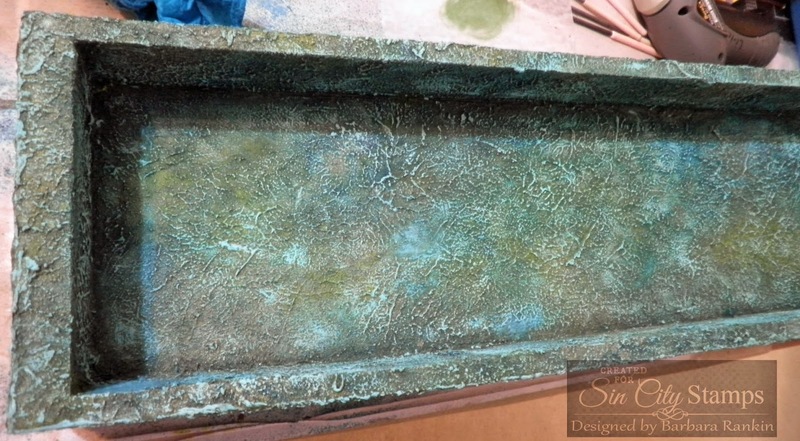 Next, I covered the front and sides of the box with the green gold texture paint. This paint is very thick and needed to be applied with a palette knife. 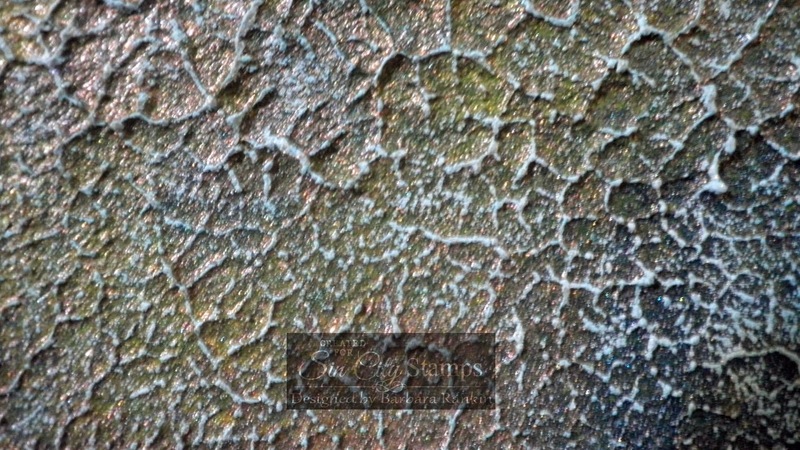 After spreading a medium thick coat, I dabbed the paint with the side of my knife to obtain this cool texture. 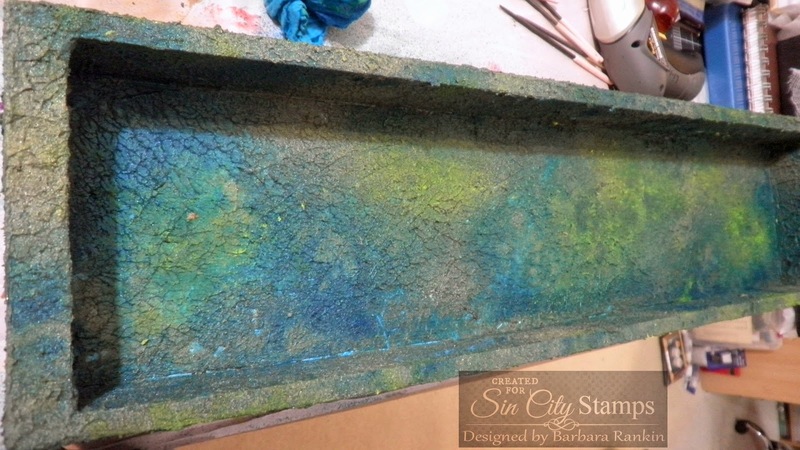 Mist entire box with Turquoise Shimmer Mist, then Primary Yellow, dabbing some of the excess mist as you go. Let dry. Apply Patina Gilder's Paste to high spots with your best tool, your finger. Mist entire box again with Heirloom Gold Perfect Pearls mist. Let dry. Can you see the pretty gold flecks? 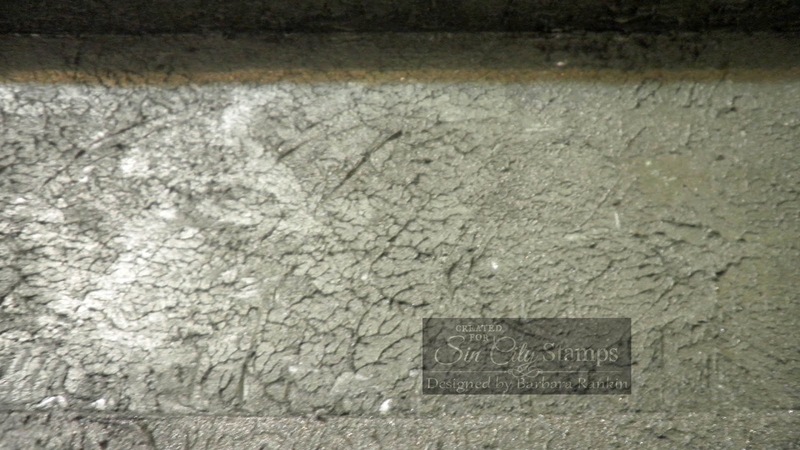 Apply German Silver Gilder's Paste to the high spots, leaving some of the Patina showing. Now I am really loving it. 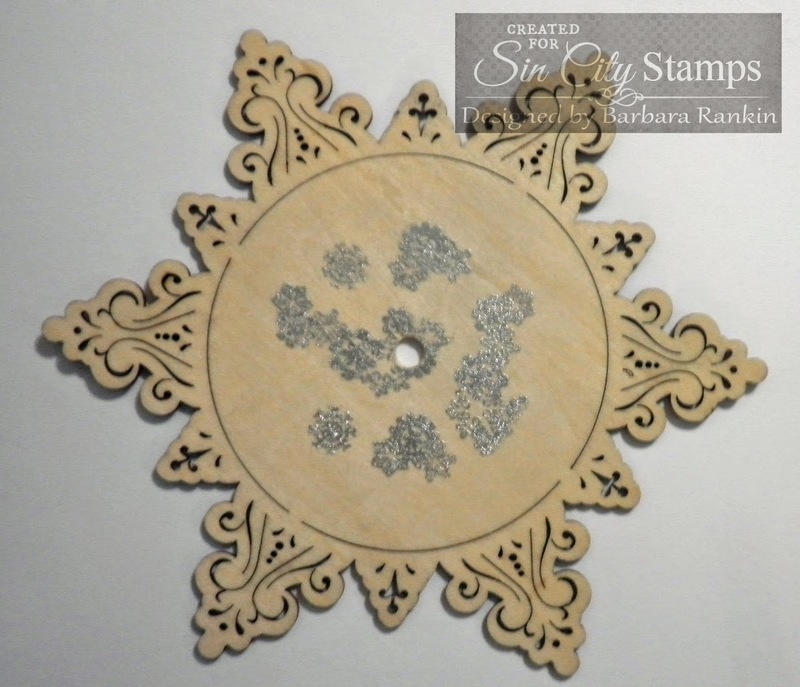 Drill a hole in the center of the wooden snowflake large enough for the clock hand shaft to go through easily. I also stamped snowflakes from Penguins on Ice set with Versamark ink and silver embossing powder. Paint the wooden snowflake with the orange yellow metal color paint. Let dry. Use a baby wipe or damp paper towel and gently remove the orange yellow paint from on top of the embossed snowflakes to reveal the silver embossing. Adhere two Clock Die Cuts together for extra thickness. 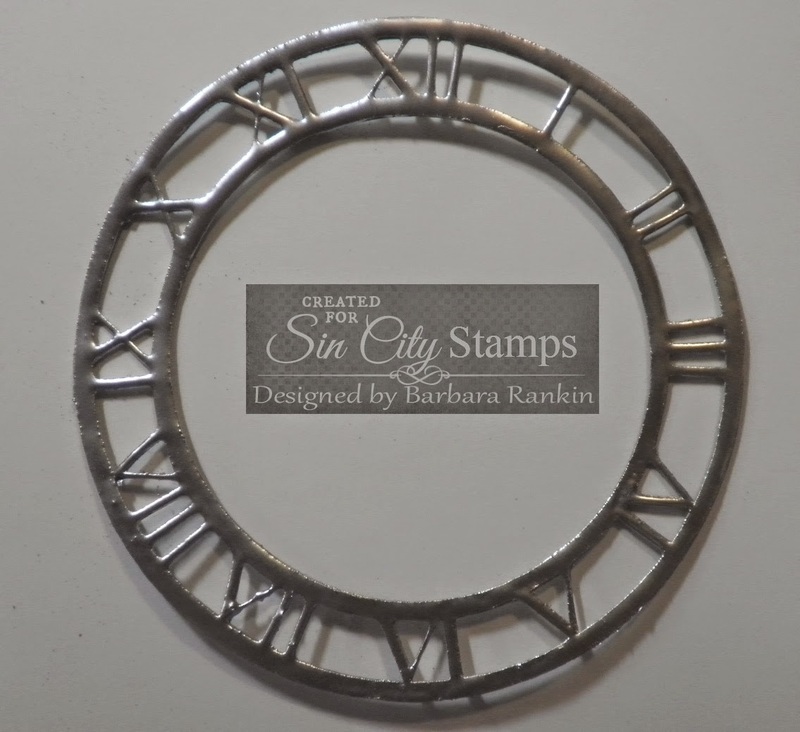 Heat emboss the clock die with Versamark ink and silver embossing powder. Two coats of embossing powder were needed to get a smooth, metal look. 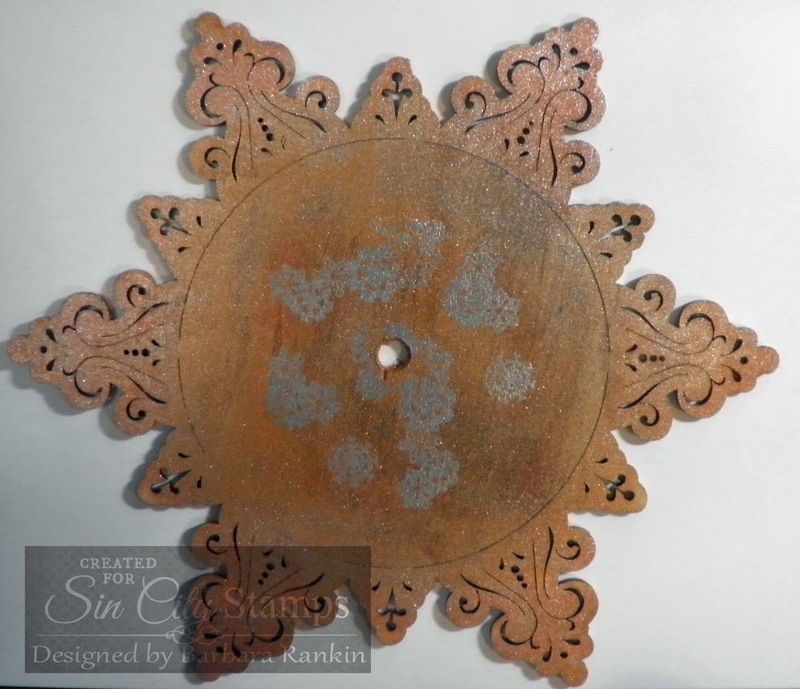 Adhere clock face to front of wooden snowflake. Paint the metal pendulum with the orange yellow metal color paint. Let dry. The photo shows just the hanger painted to show you the difference. Measure and paint two ¼" wooden dowels with the orange yellow metal paint and adhere to lower half of box along the sides. 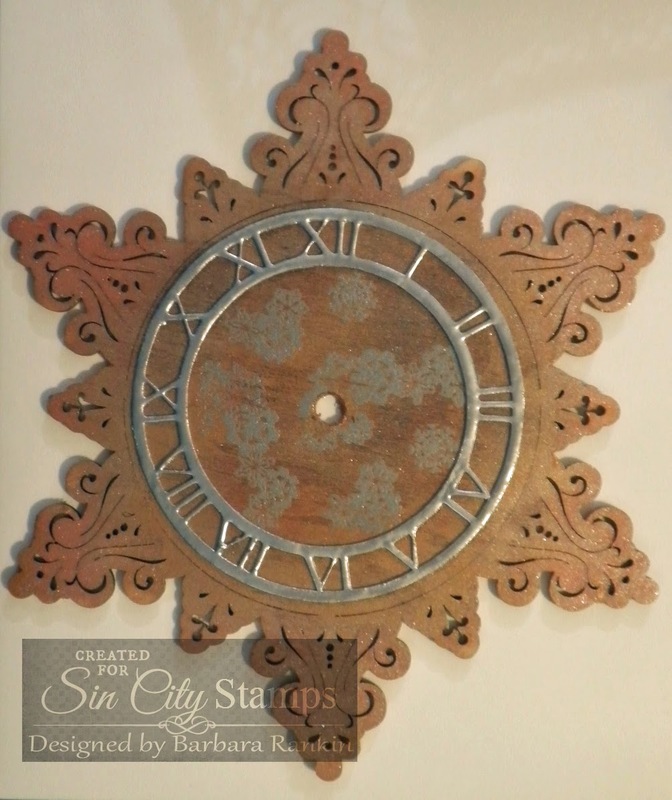 Put clock parts together and adhere wooden snowflake clock onto box at the top, just above the two dowels. 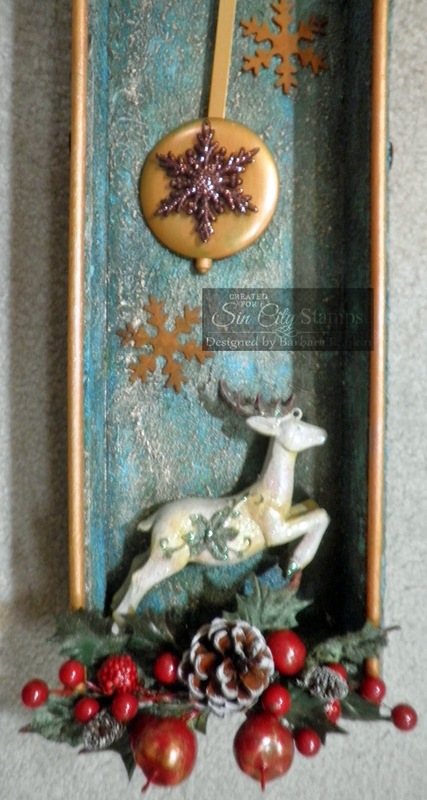 Adhere glittered snowflake to pendulum, and three rusty metal snowflakes to inside box. Adhere reindeer ornament and holly sprig to bottom of box. Select four matching scroll die cut pieces from the Clock Die Cuts, cover with Versamark ink, and heat emboss with a rust embossing powder. 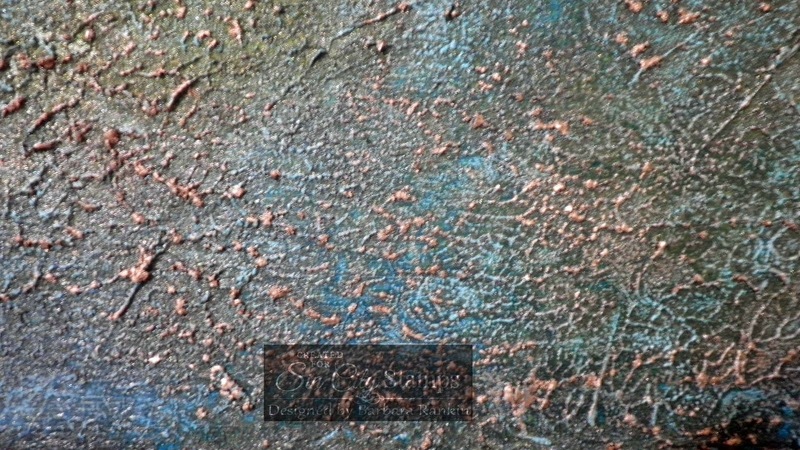 The photo shows the one on the left "rusted". Adhere to the sides of the box in the center. Another look from the front and side! I really love how this turned out. I hope you enjoyed my project today. I know it was long, but mixed media usually is. In any case, I hope you are inspired to make your own clock, whether for Christmas, or as a gift specific to someone you know. Thanks for stopping by, and be sure to visit Sin City Stamps and the team for all your stamping inspiration, and gift giving, products. Have a super wonderful weekend! Fabulous! Very creative and lots texure goodness..great job! This is totally amazing... I LOVE IT!!! Thanks, everyone! Walnut Hollow and Sin City Stamps work well together, and I had a blast making this. This is so fanciful and festive! Love it! I love your background coloring 'build up' groupings of products and colors - just lovely. I have to try this exact combination! LOL Thanks for sharing! Seriously! This is just so beautiful! Going to use that tip on using gesso to avoid splinters. thx.